West Papua was originally populated by Melanesian people some tens of thousands of years ago. After little contact with the Western world, it was finally formally colonised by the Netherlands in 1898. The islands that now make up Indonesia were also colonised by the Dutch but when the Republic of Indonesia became an independent nation state in 1949, West Papua did not join the country. 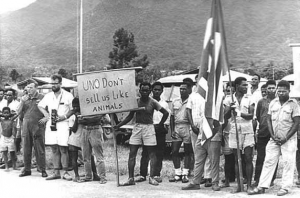 The Dutch government recognised that West Papua was geographically, ethnically and culturally very different to Indonesia and so the Dutch government began preparing West Papua for its own independence throughout the 1950s. At the end of 1961, West Papua held a Congress at which its people declared independence, and raised their new flag – the Morning Star. But within months the dream was dead. The Indonesian government wanted all of the former Dutch colonies in the Asia-Pacific region and the Indonesian military soon invaded West Papua. Conflict broke out between the Netherlands, Indonesia and the indigenous population regarding control of the territory. Unable to secure enough support for its invasion of West Papua, the Indonesian government turned to the Soviet Union for help. It was the height of the Cold War and the US government was worried that Indonesia seeking Soviet Union support might increase the spread of communism in South East Asia. In a letter from the American President to the Dutch Prime Minister, the US government strongly urged the Dutch government to hand over West Papua to Indonesia, in an attempt to appease a communist friendly Indonesian government. The US government managed to engineer a meeting between Indonesia and the Netherlands resulting in the New York Agreement, which in 1962 gave control of West Papua to the United Nations and one year later transferred control to Indonesia. The Papuans were never consulted. However, the agreement did promise them their right to self determination – a right which is guaranteed by the UN to all people in the world. But the Act was a sham. Instead of overseeing a free and fair election, the UN stood by while Indonesia rigged the vote. Declaring that the Papuans were too ‘primitive’ to cope with democracy, the Indonesian military hand-picked just 1,026 ‘representative’ people, out of a population of one million, bribed them and threatened to kill them and their families if they voted the wrong way. So strong was the intimidation that despite widespread opposition to Indonesian rule, all 1,026 voted to remain a part of Indonesia. Despite protests from the Papuans, a critical report by a UN official and condemnation of the vote in the international media, the UN shamefully sanctioned the result and West Papua has remained under control of the Indonesian state ever since. The Papuans now dub this episode ‘the Act of No Choice’. Consigning the fate of a million people to live under the brutal occupation that ensued is one of the most shameful chapters in the history of the UN. Recently there have been a number of detailed reports that heavily criticise the actions of Indonesia, the UN, and its member states during this period. The principal aim of the Free West Papua Campaign is to persuade the UN to review its role in this event and for the world allow the Papuans a true act of self determination. Since the first days of Indonesian occupation, the people and land of West Papua have been under relentless attack. In an attempt to control the Papuans, and to claim the land to make way for resource extraction, the Indonesian army has systematically murdered, raped and tortured people in numbers that could constitute a genocide. 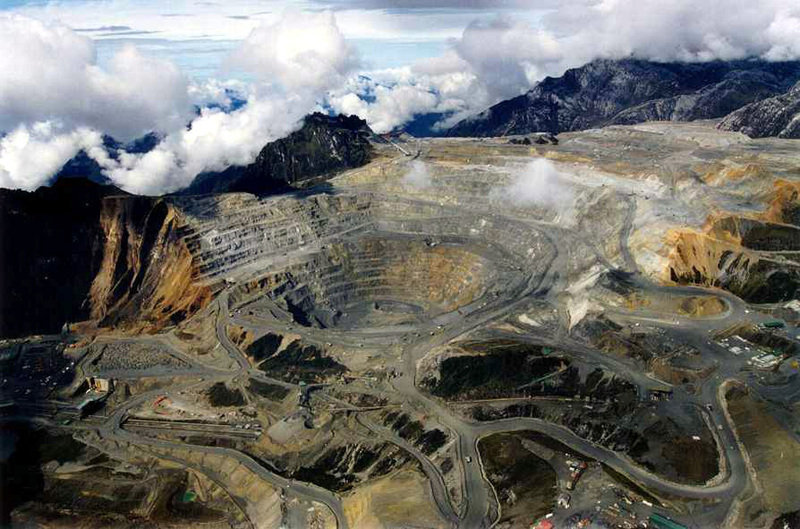 One of the worst examples of this is the displacement and killing of thousands of people to make way for the giant American- and British-owned Freeport mine, the largest gold mine in the world, which has reduced a sacred mountain to a crater and poisoned the local river system. In a further attempt to eradicate Papuan culture, around one million people from overcrowded shanty towns across Indonesia have been moved into ‘transmigration’ camps cut into the forests. Resistance to the Indonesian occupation started from the first days after the invasion. An armed guerrilla group called the OPM (Free Papua Movement) was formed in 1970 to resist the colonisation of West Papua. The OPM carried out a number of guerrilla attacks on the Indonesian military and on the holdings of multinational companies who had taken Papuan land and resources – including a successful attempt to close down the Freeport gold and copper mine. Armed mostly with bows and arrows, the small, ragged but determined OPM fought an almost unknown war against the well-armed, Western-backed Indonesian military for decades. Following the fall of the Indonesian military dictator, General Suharto, in 1998, a political space briefly opened up in West Papua. 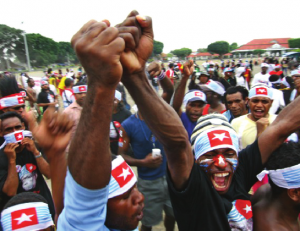 The Morning Star flag was flown again and a huge public congress was held in the year 2000 with hundreds of delegates from tribes all across Papua. 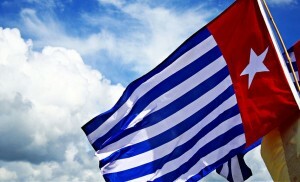 The Congress rejected the result of the 1969 Act of Free Choice and reaffirmed West Papua as an independent nation. It also gave power to the newly formed Papuan Presidium Council (PDP) to gain world recognition for West Papua’s independence. But these hopes were soon dashed. Fearing secession, the army moved in, and hundreds of people were shot and arrested for public flag raisings and independence rallies. Then, in November 2001, the charismatic president of the PDP, Theys Eluay, was assassinated by Indonesian soldiers. Independence aspirations continued to be publicly demonstrated and whilst on the ground the police and military continued to respond with violence and intimidation, the Indonesian state attempted to quell these hopes by passing special autonomy legislation. The legislation was supposed to devolve some power and distribute more resources to West Papua but it is widely regarded as a failure by the indigenous Papuans with corruption leading to money being hoarded or misspent. In recent years a new independence organisation, the KNPB (National Committee for West Papua) has become prominent. Under its guidance huge independence rallies have been held across West Papua and the West Papuan’s voice is united more than ever. As a result, many of its members have been arrested, tortured and killed. In 2012, the KNPB chairman Mako Tabuni was killed by Indonesian police, whilst many others face lengthy jail sentences of up to fifteen years just for raising the West Papuan flag. Today West Papua’s tragedy continues with ongoing reports of villages being burnt, Papuans being arrested, tortured and shot and the beautiful natural wilderness being devastated by logging, mining, agricultural and biofuel interests. "The crimes committed against the people of West Papua are some of the most shameful of the past years. The Western powers have much to answer for, and at the very least should use their ample means to bring about the withdrawal of the occupying Indonesian army and termination of the shameful exploitation of resources and destruction of the environment and the lives and societies of the people of West Papua, who have suffered far too much." But there is good news too. The issue of West Papua is creeping up the international agenda as campaign groups, Papuan leaders-in-exile and concerned people all over the world alert their leaders to the injustice that is happening in West Papua. Despite a ban on foreign journalists, media outlets are beginning to cover the story and have exposed leaked videos of West Papuans being tortured. With the advent of the International Parliamentarians for West Papua (IPWP) and the International Lawyers for West Papua (ILWP) politicians and lawyers are beginning to engage with the issue. In 2016 an historic meeting was held at the British parliament in Westminster where West Papuan leaders and other leaders from Pacific countries and elsewhere gathered together and affirmed their support for the people of West Papua being able to choose their own future to live in a free and Independent nation. Things are moving in the right direction – but they need to move faster if more bloodshed is to be avoided, and the people of West Papua’s cry for freedom is finally to be heard. You can help it happen – support the Free West Papua Campaign!